This is one of my favorite soups and one of my husband’s most requested suppers. I have always made my own meatballs, but using Celentano brand frozen meatballs has turned this dish into one of the fastest & easiest weeknight suppers that I can prepare. Makes a large pot of soup for more than one weeknight meals. Excellent to take to work for reheating! Combine broth and salsa in a medium pot; bring to a boil. Add pasta, if using, and frozen meatballs; cover, reduce heat and simmer 15 minutes. Season with salt and pepper, and stir in cilantro. 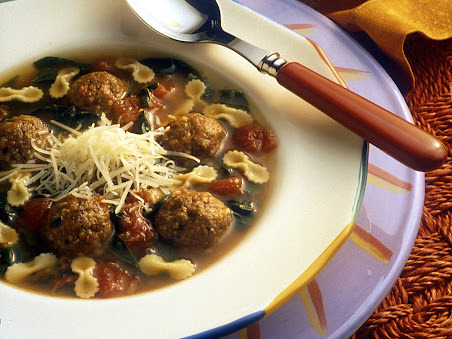 Ladle soup into bowls, sprinkle with a bit of cheese and serve. This entry was posted in Bariatric Recipes, Beef, Lamb & Pork, Main Dishes, Soup, Stew, Chowders & Chili and tagged Soups.